Expressing concern over the unprecedented scale of environmental degradation and its drastic consequences, the Vice President of India, M. Venkaiah Naidu called upon all nations to collaborate and cooperate in an equally unparalleled manner to ensure sustainable development. He said that inclusive development was central to sustainable development. “It also encompasses sustainable agriculture, sustainable mobility solutions, sustainable urbanisation, sustainable energy security and clean energy, sustainable waste management, sustainable efforts in wildlife conservation and sustainable green innovations,” he said. The VP said that there was an urgent need to make use of the endless possibilities of biotechnology and nano-technology to develop a range of green products including nano fertilisers to attain sustainability in agriculture. 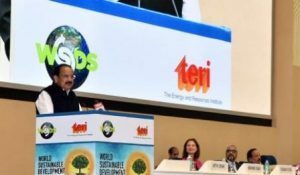 Addressing the World Sustainable Development Summit 2019, organised by The Energy and Resources Institute (TERI) in New Delhi recently, VP Naidu said that “India’s traditional practices reflected a sustainable lifestyle and the Vedic philosophy of India always emphasised the undeniable connection that human beings share with nature”. He said that every individual must contribute to sustainable development, whether by turning the ignition off at long traffic stops or by recycling and composting or by cycling to work in congested cities. Pointing out that the immediate impacts of climate change were felt by developing countries, because of higher dependence on climatic variables, VP Naidu said that everyone must join hands to minimise the impact of climate change. The Vice President quoted the ancient Indian adage – ‘Dharmo Rakshati Rakshitah’. If you promote righteousness, it will protect you and if you protect the nature, it will protect you and nourish, if we don’t, we run the risk of perishing, he added. He further said that the earth is our mother and humanity should collectively rise above our trivial differences of race, religion, and power, and act in unison to save her. Lauding the efforts of the government for initiating efforts to create International Solar Alliance with France for promoting clean energy, he said that India was on the course to achieve 175 GW renewable energy target and 40 per cent of India’s electricity generation is set to be from non-fossil fuels, by 2022. “India is committed to reducing 33 to 35 per cent of emission intensity of its GDP during 2005 to 2030 in tune with its Nationally Determined Contributions (NDCs),” he added. Saying that working with farmers to increase awareness on climate change was crucial, he also stressed upon the need to move towards more efficient systems of irrigation with ‘more crop per drop’ as a mantra. “Greater thrust has to be placed on organic farming and on the use of natural means of pest control,” he added. The VP highlighted the need to check distress migration from rural areas and said that cities must be empowered through policy mandates, institutional and financial support and legal provisions to substantially improve the quality of lives of the urban poor. He said that there was a need to build efficient, productive, equitable, smarter, more responsive and resilient cities and green habitats in keeping with Sustainable Development Goals which calls upon Governments to make cities and settlements inclusive, safe, resilient and sustainable. The Vice President said that India is amongst the few countries of the world where forests are growing in spite of exponentially rising population and livestock pressures and India’s forests act as a net carbon sink. He stated that India, along with France, initiated the International Solar Alliance which already has 121 members. “The alliance is perhaps the most decisive step taken by any world nation towards developing clean energy,” he said. “India has set a target of raising its existing 21.54 per cent forest cover to 33 per cent of the total geographical area through aggressive forestation drives,” he added. The Union Minister for Science & Technology, Earth Sciences and Environment, Forest & Climate Change, Dr. Harsh Vardhan, the former President of Sri Lanka, Chandrika Kumartunga, the former President of Mauritius, Cassam Uteem, the Minister of Energy, Water Resources and Irrigation, Nepal, Dr. Barsaman Pun, the Deputy Minister of Foreign Affairs, Norway, Marianne Hagen, the India Country Director, The World Bank, Junaid Kamal Ahmad, the Chairman, TERI, Nitin Desai, the Director General, TERI, Dr. Ajay Mathur and other dignitaries were present on the occasion.